Amanda grew up in Missoula, Montana, and attended Montana State University-Bozeman to obtain her Bachelor of Science in Nursing. Shortly after, she moved to Alaska and began working at Providence Alaska Medical Center as a registered nurse, first on the adult Progressive Care Unit, and landed in the Neonatal Intensive Care Unit for 12 rewarding years of her nursing career. In the NICU, she worked as both a staff RN and as a Clinical Resource Nurse, attending high-risk deliveries as a member of the neonatal resuscitation team, transporting infants in the Anchorage/Mat-Su area requiring a higher level of care to Providence and serving as a resource in the unit. She enjoyed caring for these high-risk infants and their families. Amanda obtained her Masters of Science degree in Nursing from the University of Alaska, Anchorage as a Family Nurse Practitioner, thereafter joining the Latouche Pediatrics team. 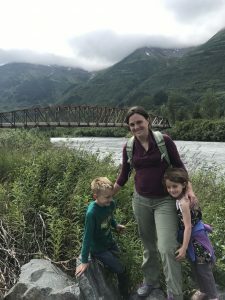 In her spare time, Amanda enjoys hunting, fishing, snowmachining, hiking, and four-wheeling with her husband Scott, and two children. She also enjoys competing in the Alaska women’s races, particularly the Gold Nugget Triathlon.